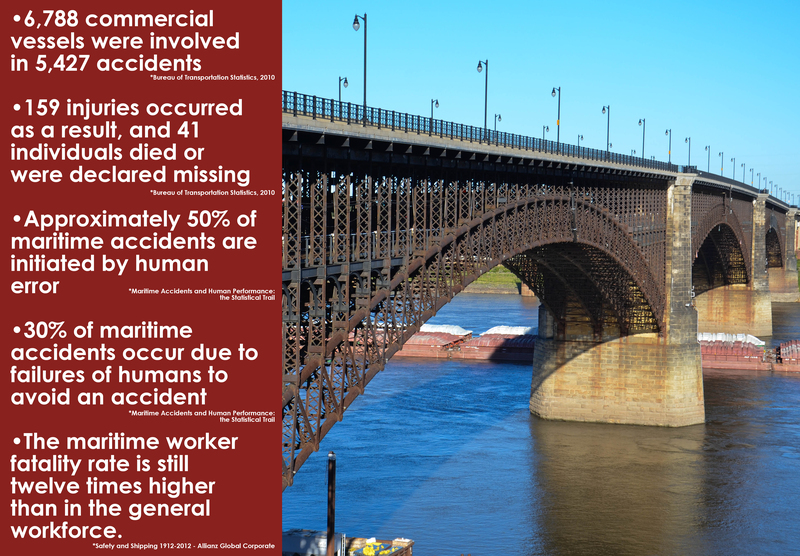 One recent accident on the water involved a worker on the Eads Bridge in the St. Louis, Missouri area. The 24-year-old man was perched atop scaffolding equipment performing some sort of vacuuming work at the time. The victim was working on a suspended construction scaffold on the Eads Bridge when a southbound towboat and barge struck the construction scaffold, causing the scaffold and the victim to be torn away from the Eads Bridge and become entangled on the towboat. He landed on the towboat that struck the Eads Bridge and was pronounced dead at the scene of the fall. 10 other people sustained minor injuries due to the accident. The Occupational Safety and Health Administration (OSHA) as well as the U.S. Coast Guard are investigating this water-related accident. Maritime workers are unable to file workers’ compensation claims in the same way that land-based employees can do in the wake of a work accident. They are covered under special personal injury laws like the Jones Act, which allows seamen to sue their employers for acts of negligence that cause or contribute to a worker’s injury. The general definition of seamen are those who perform the majority of their work duties above a vessel—any sort of boat or ship. In order for a part-time seaman to qualify for a Jones Act claim, he or she must work on the vessel for at least 30% of the time. •6,788 commercial vessels were involved in 5,427 accidents •159 injuries occurred as a result, and 41 individuals died or were declared missing •Approximately 50% of maritime accidents are initiated by human error •30% of maritime accidents occur due to failures of humans to avoid an accident •The maritime worker fatality rate is still twelve times higher than in the general workforce. This is the latest in a string of fatal bridge worker accidents involving the same Missouri company that employed the 24-year-old man who died beneath the Eads Bridge. One worker died after a scaffolding platform collapses under the Jefferson Barracks Bridge. Another died after a fall into a hole in another scaffolding platform on the Lexington Bridge in Kansas City. A third worker died in a fall from the same bridge just a few months later. Further illustrating the dangers of river work, the Sunday after the scaffolding death, a tugboat collided with a barge around 6:30 p.m and the tugboat was pulled underneath some nearby barges. Two crew members on the tugboat were rescued by another tugboat. They were not injured. Any time that a maritime worker suffers serious injuries or dies while working, they have the right to seek a Jones Act claim against their employer. Our St. Louis law firm is experienced in filing this type of claim for workers from Missouri, Illinois, and other parts of the country. We can be reached at no charge by dialing 1-888-586-7041 and can provide you more details on the ins and outs of filing a Jones Act claim. No injured worker should have to worry about how they are going to cover medical or living expenses after suffering an injury on the job. While normal workers’ compensation insurance does not apply, a Jones Act claim could be the right step to take. We will be happy to arrange a free initial consultation to discuss your specific case.